River Ganga is considered as our National River, but it was polluted more than other rivers. So, there was a need of cleaning the River Ganga. As a citizen of India, it is all of our duty to keep our National River in a good condition. This article contains history about the River Ganga and the causes which are lead to the impurity of the Ganga, the need for cleaning the Ganga, the Administrative steps which are taken by the Government to clean-up the Ganga and also deals with the Ministry of Water Resources Development and Ganga Rejuvenation in a broader manner and also contains suggestions for the improvement of these plans. Indian civilization grew up under the care of river Ganga for thousands of years, grown up for generations by her generous boundaries. River Ganga along with her many sub rivers provided material, spiritual, and cultural sustenance to millions of people who lived in and around her basin. To the Indian mind, River Ganga is not only the holiest of rivers and purifier of moral beings but also a living goddess! So she was considered as “Mother Ganga”. Even today river Ganga was considered as the physical and spiritual lifeline of India. 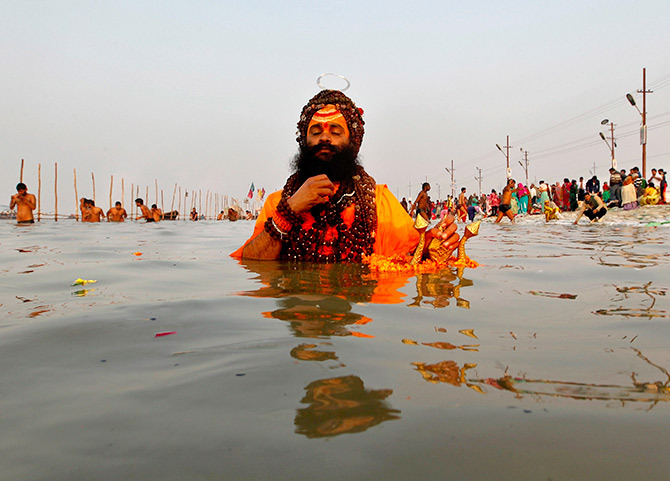 Therefore, Ganga was officially declared as India’s National River by the government on November 4, 2008. But national concern about environmental problems of Ganga River and her basin had also become serious by then. In this article, we discuss the problems relating to Ganga and the authorities established for its rehabilitation. The River Ganga, the most sacred and important rivers of India, is considered as the cradle of Indian civilization. The 2,525 km long river starts from Gangotri in the Himalayas and joins the Bay of Bengal, at Ganga Sagar. The average depth of the river is 52 feet & the Maximum is 100 feet. Gangotri is situated at the bank of river Bhagirathi in Uttarkashi District of Uttarakhand located at a height of 3042 metres from the sea level.It has a catchment area of 8,61,404 square km covering over a quarter of country’s land area and sustaining 46% of the total population of the country. It touches 118 towns and 1657 Gram Panchayats across 66 districts of 5 states of India. At the previous stage River Ganga was known as the symbol of purity, so taking a bath here is known as a sacred activity. But now Ganga was polluted mostly by the industries, human activities and natural causes. Soil erosion due to rains, deposition of dead and decaying remains of plants and animals, high-speed winds, floods, etc., are some of the natural phenomena that contribute to water pollution. Due to the mixing of Sewage disposal and Industrial waste in the River Ganga causes pollution to it. Our national river is one of the most polluted rivers in the country, and one of the 10 most threatened river basins in the world. The quality of the Ganges is decreasing steadily. Due to the mixing of wastages, the water of Ganga is not only unfit for drinking but also harmful to agricultural purposes. The level of Coliform bacteria, a type of bacteria which indicates the purity of water, must be below 50 for drinking and above 5000 for agricultural purposes. 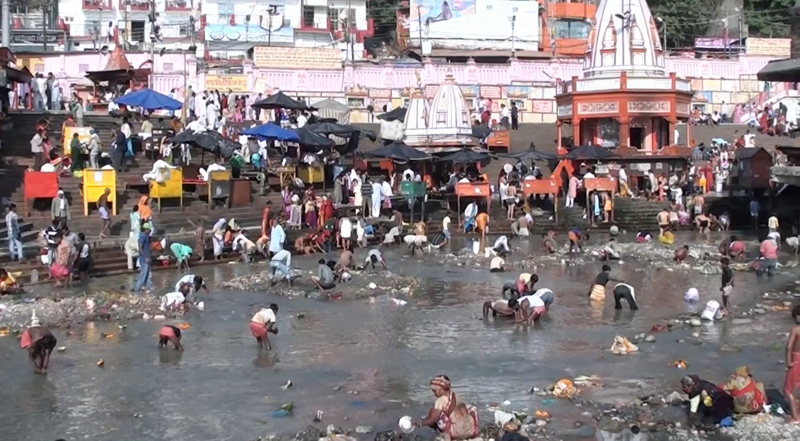 The present stage of Coliform in the Ganga is 5500.Disposal of dead bodies and immersion of idols of gods and goddesses into water bodies during various festivals in India degrade the quality of water. Such water pollution can affect the ecosystem of the river. The River Ganga was most polluted in the recent years. Recently, discharges from the Barauni Oil Refinery caused gross pollution along a long stretch of the main Ganga. The main factories, which pollute the stream are sugar, distillery, tin, glycerine, paint soap, rayon, silk and yarn. A major step to control and clean up the Ganga had been taken in1984 when the Central Ganga authority was established to implement the Ganga Action Plan. This plan had identified 27 cities and 120 factories as points of pollution from Haridwar to Hooghly. According to a recent survey made by The Department of Atomic Energy’s National Centre for Compositional Characterisation of Materials (NCCM) in Hyderabad has tested water samples from Ganga and found the river water contained Carcinogens. So, a dip in river Ganga can possibly cause cancer. A study conducted by the Uttaranchal Environment Protection and Pollution Control Board (UEPPCB) categorised river water into four categories, A being fit for drinking, B for bathing, C for agriculture and D is for excessive pollution level. The sad news is that the Ganga’s water is given a definite D.
There are 400 million people who live close to the river Ganga, so there was a need to clean the River Ganga. Because their basic needs should be fulfilled only by the river. The government had taken many steps to clean the River Ganga. It comes under The Union ministry of water resource and river development. The Environment (protection) Act, 1986 made empower the Central Government to take all necessary measures to protect and improve the environment. The Ministry of Water Resources, River Development and Ganga Rejuvenation is the apex body for formulation and administration of rules and regulations dealing with development and regulations of the water resources in India. The Ministry was formed in January 1985 following the separation of the separation of the then Ministry of Irrigation and Power, when the department of Irrigation was reconstituted as the Ministry of Water Resources. In July 2014, the Ministry was renamed to “Ministry of Water Resources, River Development & Ganga Rejuvenation”, making it the National Ganga River Basin Authority for conservation, development, management in the river Ganges and its tributaries. The Ganga Action Plan or GAP was a program launched by Government of India in April 1985 in order to reduce the pollution in the river Ganga. The program was launched with more importance but it failed to reduce the pollution level in Ganga. This plan spent 901.71 Crore rupees over a period of 15 years. The Cabinet approved the GAP (Ganga Action Plan) in April 1985 as a 100 percent centrally sponsored scheme. This Action Plan has two Phases. The Ganga Action Plan (GAP) Phase-I was launched in 1985 and later GAP Phase-II was initiated in 1993 with the objective of improving the water quality of river Ganga and was later expanded to include some of its tributaries also. To oversee the implementation of the Ganga Action Plan and to lay down the policies and programmes, Government of India constituted a Central Ganga Authority (CGA) in February 1985, later it was renamed as the National River Conservation Authority (NRCA) in September 1995, under the chairmanship of the Prime Minister. The Government also established the Ganga Project Directorate (GDP) in June 1985 as a wing of Department of Environment, to execute the projects under the guidance and supervision of the CGA. According to many Environmental thinkers, this GAP was an over-ambitious project. The money which is allocated to spend for this program was not used properly, due to Corruption. The Government of India has given Ganga the status of a National River and has constituted the National Ganga River Basin Authority (NRGBA) on 20thFebruary 2009 under Section 3(3) of Environment (protection) Act, 1986. (b) Maintaining environmental flows in the river Ganga with the aim of ensuring water quality and environmentally sustainable development. The Ministry of Water Resources, River Development and Ganga Rejuvenation (MoWR, RG & GR) is the ministry for the NGRBA. Prime Minister is considered as the Chairperson of the authority and Union Ministers and Chief Ministers of the states as its members. The NGRBA is fully operational and also supported by the state level state Ganga River Conservative Authorities (SGRCAs) in five Ganga basin States which are chaired by the Chief Ministers of the respective states. National Ganga River Basin Authority (NGRBA) has started the Mission Clean Ganga with a changed and comprehensive approach to succeeding the challenges posed to Ganga through four different sectors, namely, of wastewater management, solid waste management, industrial pollution and riverfront development. ·Conservation of the river Ganga by adopting a Comprehensive river basin approach. The NMCG is established by the Ministry of Water Resources, River Development and Ganga Rejuvenation society under the Societies Registration Act 1860 for the implementation of the World Bank assisted National Ganga River Basin Project (NGRBP) of the National Ganga River Basin Authority (NGRBA). The Order issued through the Gazette of India on 7thOctober 2016 constituting River Ganga (Rejuvenation, Protection and management) Authorities under the Environment (Protection) Act, 1986 lays down a new institutional structure for policy and implementation in fast-track manner and empowers NMCG to discharge its functions in independent and accountable manner. The said Authority has jurisdiction over the 5 States along the mainstream of Ganga and Union territory of Delhi along with the major tributaries of the river Ganga. Under Rural Sanitation Program, NMCG has provided Rs 263 Crore to Ministry of Drinking Water & Sanitation for construction of toilets. In May 2015, the Government approved the Namami Gange Programme as a comprehensive mechanism to take up initiatives for Rejuvenation of river Ganga and its tributaries as a Central Sector Scheme with hundred percent funding by the Union Government. It is an integrated Project that will also help the population of India who is dependent on the river. Initially, the Project was allocated a budget of Rs.2037Crores.Under this Project, the government ordered 48 out of industries to shut down. The scheme will cover 47 towns in 8 states. This is not the first project to clean Ganga, previous governments have also introduced many projects to clean the river. But most of them did not perform as expected. So, the Namami Gange Project has strict rules. The programme, despite making moderate gains in arresting the declines in Water quality, had certain limitations in implementation. The Project is set to get completed by the year 2020. As a part of a Namami Gange Project, the banks of the river will become free of open defecation. So, the Namami Gange Project and the Swatch Bharat Abhiyan will go hand in hand in this case. Ganga is not only a river of religious importance but many people depend on it for their livelihood. We want the campaign to be associated with employment and livelihood. Union Water Resources Minister Uma Bharti said Uttarakhand is not the only source of the river Ganga but it has huge potential for medicine-based services. The state can earn worldwide fame by growing and processing medicinal plants. Speaking about her stance on the construction of dams, the Union Minister said she was not against it unless dam projects hinder the environment flow of rivers. National Green Tribunal plays an important role in giving directions and dealing with the cases in cleaning the Ganga. Ever since the Supreme Court had transferred 30-year-old cases, which dealt with the tardiness in cleaning the Ganga, to the routinely pulled up officials in the Central Pollution Control Board and the Union Ministry of Water Resources and Ganga Rejuvenation, and the Uttar Pradesh State Water Board for poorly executing projects. The NGT has fined Officials for inaccurate information on the 30 drains in the State and “wasting public money” on commissioning projects that didn’t properly account for the pollution load in the city. Out of a ₹20,000-crore clean-up programme, only ₹2,000 crore has been sanctioned to the National Mission for Clean Ganga. In M.C. Mehta Vs Union of India & Others, National Green Tribunal notes that GAP I & II has failed to yield the required results and on contrary there has been a tremendous increase in the Industrial and Sewage pollution load in river Ganga and its tributaries. 1) All the 86 drains, as well as other major drains, should be waste removed. 2) There shall be a complete prohibition on disposing of MSW, E-waste or bio-medical waste into the river Ganga or its tributaries. 3) Any Government Agency, Public Authority, Industry or person who violates the directions shall be liable to pay environmental Compensation of Rs.50, 000 for each breach or default. The Centre has approved the River Ganga (Rejuvenation, Protection and Management) Authorities Order, 2016, which gives the National Mission for Clean Ganga (NMCG) more powers in taking action against polluting industries. The power so far lays with the Central Pollution Board. Water Resources Minister Uma Bharti said, “It will also ensure proper coordination with the local bodies and compliance with directions of the NMCG for pollution abatement of the Ganga”. The Order also delegates financial and administrative powers to NMCG to accelerate the process of project implementation for Ganga rejuvenation. It has been decided to grant a mission status to the Authority with corresponding powers under Environment (Protection) Act, 1986. The NMCG will have a two-tier management structure with a Governing Council (GC) and an Executive Committee (EC). The order delegates financial and administrative powers to NMCG to accelerate the process of project implementation for Ganga rejuvenation. Finally, this order has given more powers to the National Mission for Clean Ganga (NMCG) in taking action against polluting industries. The NDA government’s record in implementing Prime Minister Narendra Modi’s pet Clean Ganga project has been very poor, and the national mission has been able to spend less than a quarter of the funds earmarked for the project in the last two financial years, said a report tabled by the CAG. According to CAG report, “Out of ₹6,705 crore earmarked during 2015-16 and 2016-17, NMCG [National Mission for Clean Ganga] could spend only ₹1,665.41 crore, less than a quarter of the expected year-wise release of funds,”. So, there was a low utilisation of funds indicate poor implementation of the programme. Not having an action plan also led to non-utilization of any amount from the corpus of ₹198.14 crore available in the Clean Ganga Fund created through voluntary donations by citizens and non-resident Indians. So, there was a deficiency in planning and laxity in spending available funds by the State governments as targets set for constriction household toilets and making villages open defecation free were not achieved. Out of 46 sewage treatment plants, there were delays in 26 projects due to delay in execution of projects, non-availability of land and slow progress of work by contractors. ·If there was any need for the dam, it must be constructed in a way that it shouldn’t decrease the flow of the river. ·Electronic crematoriums must be set up near the river banks for free or low charges. ·Spiritual leaders should encourage devotees to offers prayers in an eco-friendly way. ·Heavy, fines must be levied on those who pollute the water. ·Students must be taught about the importance of Cleaning Ganga and the reasons for pollution. ·Special task force should be appointed for maintenance of the river. ·Local people should be involved in cleaning mission. ·Trees along the Soil erosion and in cleaning the pollutants. ·The outdated sewage plants need to be modernized. Small sewage plants should be set up in small towns and villages around Ganga River. Sewage plants which are situated in the Agricultural land should be avoided. Instead of a large amount of money was allocated to the Clean Ganga Project, there was no proper implementation of the plans. There was lack of awareness among the people. So, spreading awareness about the condition of the river is the main solution to river Ganga. With effective plans and implementation, the Ganga River can be cleaned. Not only river Ganga, most of the rivers which are in our country are should be cleaned. A need of cleaning Ganga is considered as important because it is our National River. So, I hereby conclude the article by saying that, cleaning the River Ganga should not be considered as the work of government, it only becomes possible when each one of the Citizen thinks that it was their duty towards their country.